Before You Begin: This is an older version of the Magoosh 3 Month Beginner’s Study Schedule (Version A). You should only use this plan if you started with this study plan before July 2015. If you are just starting to study, please use the most updated version! 9) a good 1-2 hours a day, for five days a week, and then a good 3-4 stint on the weekend (“Day Six”) — with a day off on the weekend as well. If you would rather free up some week nights, and move some of the material into the other weekend day, you are welcome to do that. Note: Many folks find that each day’s assignments take 1-2 hours, although times to complete them will vary for different students. 1) Today, you are going to write two essays, half an hour each. In OG, in the section “Analysis of an Argument Sample Topics,” pick two Argument sample prompts at random (or have someone pick them for you), and for each, take 30 minutes to write an essay. Now that you have these essays, what do you do with them? If you have a friend or mentor who is a gifted writer, see if they would read the essays for you and critique them. If they are willing, you can show them the assessment criteria in the OG, and ask them to follow it. Alternately, you can upload your essays in the online forms and ask for feedback. 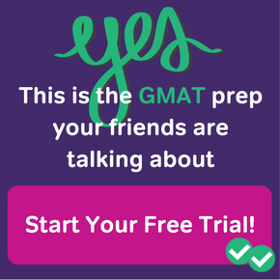 1)Go to http://www.mba.com/the-gmat/download-free-test-preparation-software.aspx, download the free software. These essays you will either share with a trusted friend or mentor, or post in the online forums asking for feedback. 2) Go to GMAC’s IR website — the code in the back of your OG should give you full access to this site. Do the first 15 IR questions, setting for yourself a 38 minute limit. When you are done, go back and read carefully the full explanation for each question. 2) Go GMAC’s IR website. Do the next 15 IR questions, setting for yourself a 38 minute limit. When you are done, go back and read carefully the full explanation for each question. 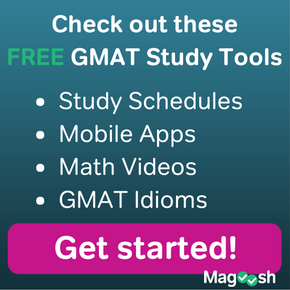 1) Take another full length GMAT on the GMAC software (You can do each test in the software three times). Go through the entire solution after you are done, taking notes in your journal on anything you got wrong. 1) Today is the last time you are going to write two essays, half an hour each. In OG, in the section “Analysis of an Argument Sample Topics,” pick two Argument sample prompts at random (or have someone pick them for you), and for each, take 30 minutes to write an essay. 2) Go GMAC’s IR website. Do the remaining 5 IR questions, setting for yourself a 13 minute limit. When you are done, go back and read carefully the full explanation for each question. 3) On Magoosh, do the IR questions. At this point, you have seen every the Magoosh at least once. Judge for yourself, based on which questions/concepts you have been finding difficult, which videos you should watch again. Keep a pace of watching 7-8 Magoosh lesson videos a day. In this week, you will be finishing up all the questions in Magoosh and all the questions in the OG. 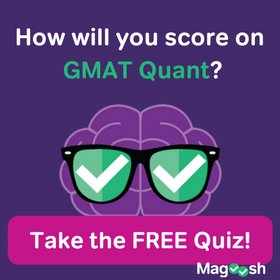 7) If you have a weekend day that is more than a couple days for the real GMAT, then take one final practice GMAT from the GMAT software, as on Week Eleven, Day Six.